One of the e-book that I received as a bonus when I bought Convert 2 EV was on the subject solar power for homes. It was a very interesting read. The book basically show you the benefits of living off the nation power grid. 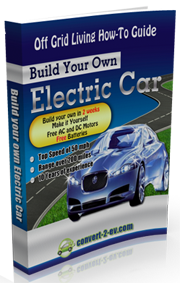 There is one chapter that focuses on charging your electric vehicle batteries with [tag-tec]solar energy[/tag-tec]. Electric car has been proven to be cheaper to run compared to a conventional gasoline driven car. The operating cost of an EV is basically the electric bill you have to pay when you charge the batteries overnight. If we can charge the batteries using free energy from the sun, wouldn’t that lower the cost of running an electric vehicle even further? I guess it would. My next question is how much does it cost to setup a solar power for homes system? The book mentioned that you can build your own solar array at home with as little as US300. I honestly don’t think the investment cost is that low. I don’t think it is impossible to achieve that figure, but I understand it will take a lot of preliminary preparation to do that. Just like a DIY electric car conversion, you can reduce your cost by spending the time to source for cheap, reconditioned of used parts and components. I believe anyone who has the skill and dedication to do their own electric car retrofitting will be able to build their own solar power system to charge the batteries. You have all the tools and the know how to use the tools. Building an electric car is much harder than setting up a residential solar array. Certainly, but we all need to realise that adding Solar to their property is an purchase that could improve the longer term value of their building if / when they decide to sell. With the environment the way it is going we are not able to overlook any product that delivers no cost electricity at no cost to both the customer and more notably the environment!